The U.S. Navy is in a revolutionary period of change. Historic military tactics combined with modern materials and technology present a formidable fleet protection challenge for the Navy today. One of the greatest threats to the Navy is low tech vessel attacks with conventional explosives, as seen on October 12, 2000, when the USS Cole was attacked, killing 17 sailors and wounding 39 others and in the continued success of pirates. 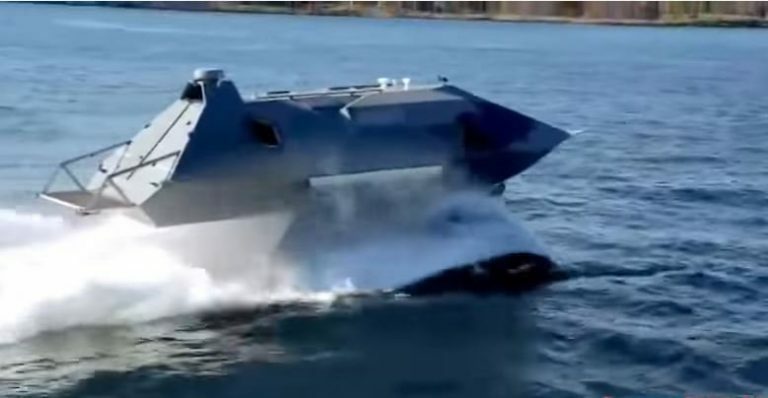 This fast attack stealth boat will make a difference. GHOST is a super-cavitating surface craft which is able to achieve 900 times less hull friction compared to a conventional watercraft and is developed by U.S. Citizens for the U.S. Navy at no cost to the U.S. government for providing superior protection to U.S. service personnel. While the GHOST is a surface vessel, the hydrodynamics of the twin submerged buoyant tubular foils are also a test bed for Juliet Marine’s next planned prototype, a long duration UUV. The GHOST is a revolutionary proprietary technology vessel platform that will assure force protection through stealth fighter/attack capabilities along with integrated situation awareness. In this new pro-DoD environment, it’s possible to dream with such a vessel.